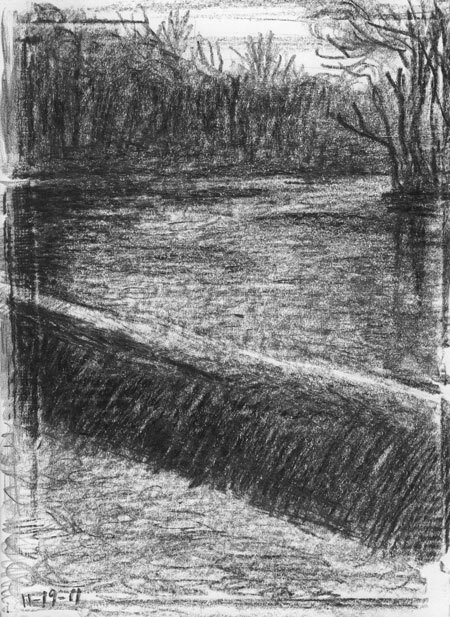 I needed to get outside after a day of being in a car all day and eating rich food (or so it seemed) so as soon as we got home I laced up my boots and grabbed my sketchbook and a black crayon and walked to the river. It was sunset and the light was changing every few seconds. There was also a breeze so the reflections on the water were constantly moving and shifting. 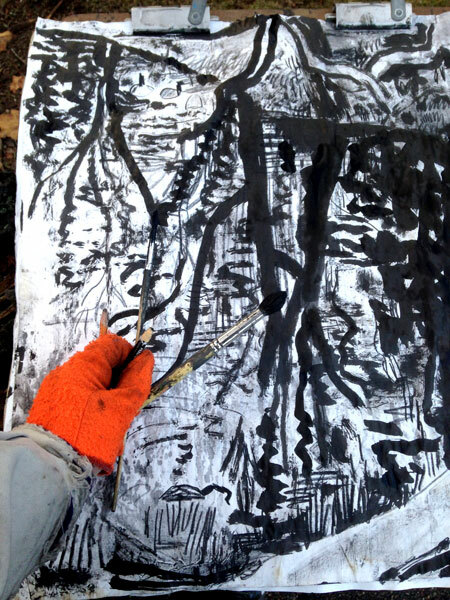 As it got darker and the drawing progressed, I kept shading the whole drawing with the broad side of the crayon. The details started to clog and a graininess emerged that suggested the very particles of air and matter that intercept the sun's photons. Matter becomes film; these mute microscopic processors hold and then scatter their small allotment of visible solar energy. Their vibrations are the matrix that enfolds the more solid furniture of this real place. If you like this sort of thing, I suggest you look at the drawings of the famous French pointillist painter George Seurat.